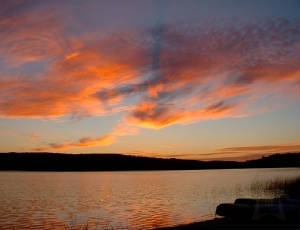 From Blue Lakes Vacation Rentals, The best in Honeymoon Getaways and Anniversary Getaways in Northern Michigan. Be our guest at one of our newest Northern Michigan lakefront vacation getaways. This \"Cottage Style\" holiday home features, Maple flooring, milled beam accents, ceramic tile, cottage decor, and a cozy fireplace. It is also set up for family fun, with separate areas for adults, and little ones alike. 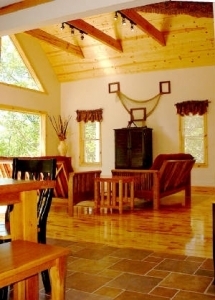 This newer Romantic Weekend Cabin vacation Rental in Michigan is located right in the center of one of Northern Michigan\'s most desired vacation destinations. 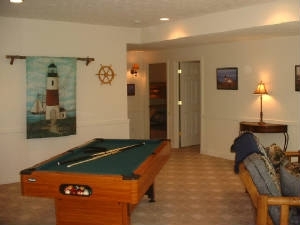 \"The Landing\" is only minutes from such areas as Empire, Glen Arbor, Sleeping Bear Dunes, Crystal Lake and Frankfort. 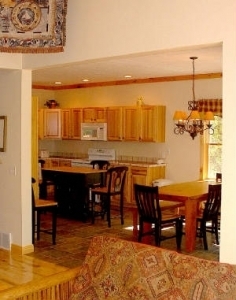 \"The Landing\" is directly across the street from the Sleeping Bear National Lakeshore and yet has it\'s own private sandy beach frontage on Long Lake. 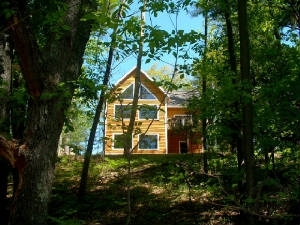 It is situated atop a natural slope with views of Long Lake, beautiful towering trees and wildlife. The best in Romantic Getaways near Lake Michigan features 160\' of very private sandy bottom frontage on peaceful all-sports Long Lake in Benzie county. RENTAL FEE: For use of the Property as a vacationing home, Guests shall pay above fees to the Owner: $250 at time of reservation, 50% (less $250) in March and the remaining 50% of fee no later than 30 days prior to arrival. CANCELLATION: If a Guest wishes to cancel this Agreement, the Guest shall provide the Owner with written notice. If the Renter's notice of cancellation is received 30 days prior to arrival date, the 50% fee will be refunded at 80% only if the reserved nights can be re-booked in full. If the premises are not re-booked or the Guest cancels with-in 30 days of the arrival date, the fee is non-refundable.